The MacBook Air, the Lenovo X301, the Asus Eee PC--dinosaurs! At least, they are compared with the ideal ultraportable laptop we have in our heads. This month we took a stab at imagining the perfect ultraportable, and here are the features we came up with. Of course, we're not all geniuses (just some of us are), so if you have some better ideas for our mashed-up machine, tell us in the comments section. 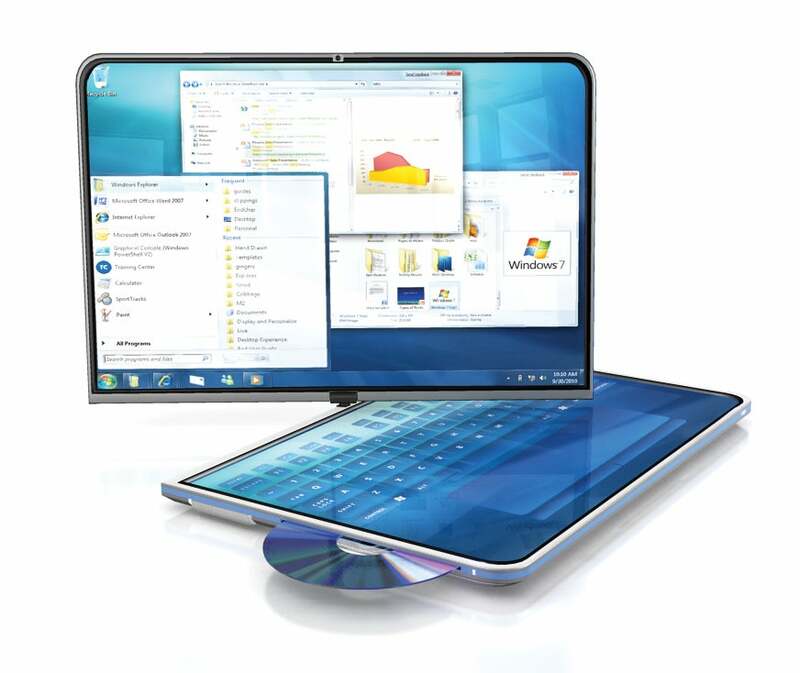 Images rendered for PC World by Bryan Christie Design (click through for larger images). Dual, multitouch AMOLED screens: When Windows 7 finally goes on sale (possibly by year's end), a range of new desktops and laptops that can take full advantage of the OS's multitouch capabilities will likely launch alongside it. 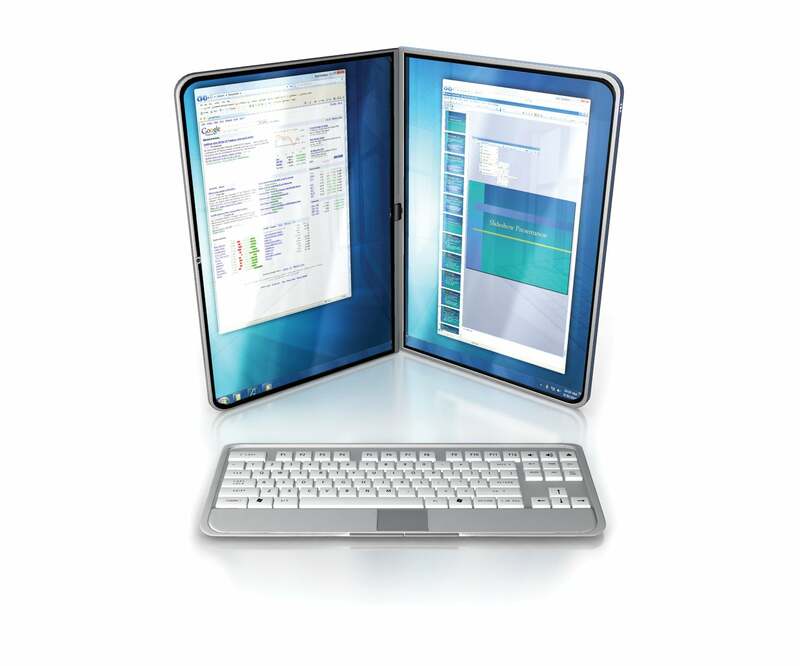 The market may also see laptops with dual touch screens sooner than you might think. Our dream ultraportable would convert between standard-clamshell and tablet-slate modes, and open flat like a book on a table. 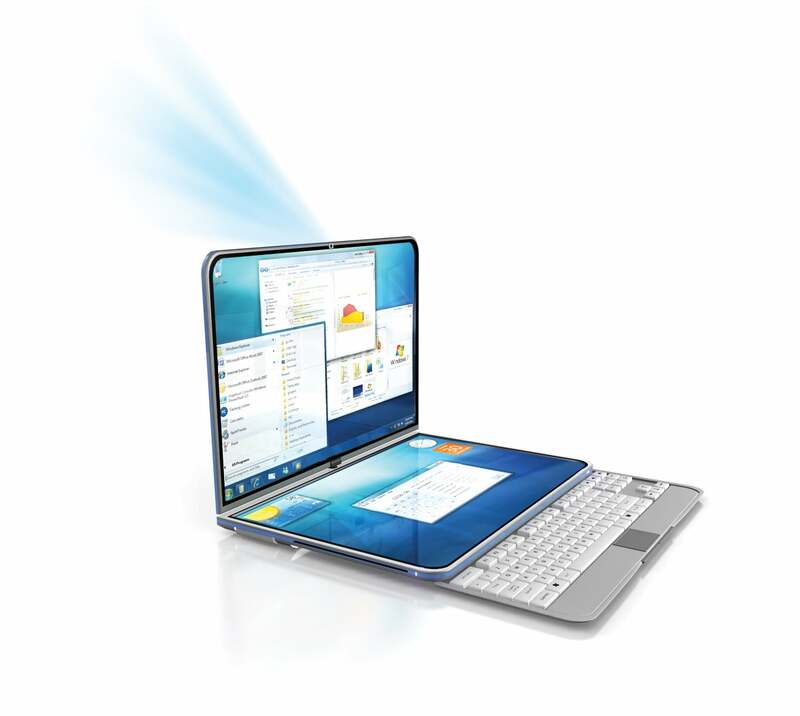 Built-in pico projector: Why lug a projector to your next presentation when one could be built into your laptop? Asus unveiled a concept portable at Computex 2008 that could offer just that feature. We'd also include an ultrathin, slide-away, detachable Bluetooth keyboard (for when the touch keys just don't cut it), plus next-generation battery technology such as direct methanol fuel cells or LiFePO4. Portrait/book mode: Borrowing liberally from the OLPC XO-2's design, our concept can sit sideways to provide dual portrait screens ideal for reading e-books or getting more done at a desk. On the road, we'd want quick-resume technology, a solid-state hard drive with a drop sensor, and an embedded Gobi wireless-data chip that makes it easy to select any wireless carrier for accessing the Web or for using the device's built-in GPS features. What we took: Convertible tablet design with two-finger, multitouch screen. Available now. What we took: Multitouch tablet design, netbook size, built-in GPS. Expected later this year. What we took: Dual touch screens, LiFePO4 battery technology. Expected in 2010. What we took: Asus is exploring prototypes with dual touch screens or a built-in projector.